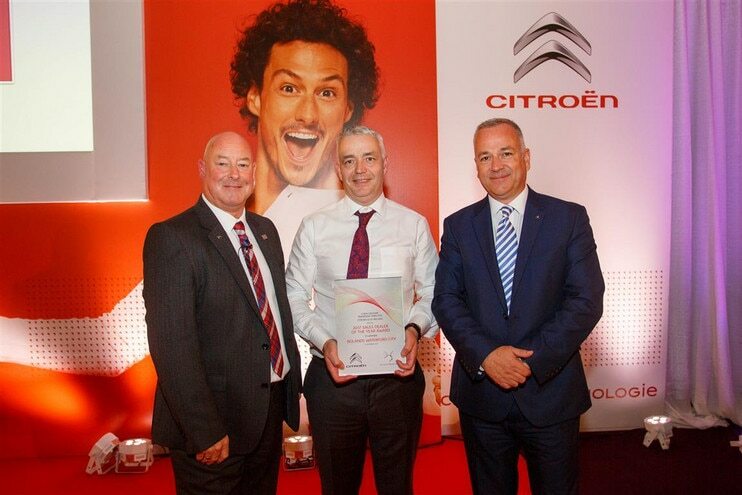 Bolands Waterford has received the accolade of Citroën & DS Automobiles Sales Dealer of the Year Award 2017, from a network of 19 authorised sales dealerships nationwide. Jim Boland was officially presented with the award by Chris Graham, Managing Director, Citroën & DS Ireland at the 2017 Dealer Conference which took place at the Mullingar Park Hotel last month. Bolands Waterford has been a franchise of the Citroën & DS Automobiles Brands for 5 years and is home to a brilliant team of Sales and Aftersales professionals who are ready and able to help customers with their vehicle requirements. Their state of the art premises are located on the Cork Road, Waterford. Pictured at the presentation is Chris Graham, Managing Director, Citroën & DS Ireland, Jim Boland, Dealer Principal, Bolands Waterford and Paul Tunnicliffe, Managing Director of International Motors Limited (IML), UK & Ireland.